All my life, I have enjoyed the reputation of being someone who disrupted prevailing ideas. Now that I'm in my 80th year, I can play on my age and provoke people even more. Benoît B. Mandelbrot (20 November 1924 – 14 October 2010) was a Poland-born French-American mathematician known as the "father of fractal geometry". Nature exhibits not simply a higher degree but an altogether different level of complexity … The existence of these patterns challenges us to study these forms that Euclid leaves aside as being "formless." I claim that many patterns of Nature are so irregular and fragmented, that, compared with Euclid — a term used in this work to denote all of standard geometry — Nature exhibits not simply a higher degree but an altogether different level of complexity … The existence of these patterns challenges us to study these forms that Euclid leaves aside as being "formless," to investigate the morphology of the "amorphous." I conceived, developed and applied in many areas a new geometry of nature, which finds order in chaotic shapes and processes. It grew without a name until 1975, when I coined a new word to denote it, fractal geometry, from the Latin word for irregular and broken up, fractus. Today you might say that, until fractal geometry became organized, my life had followed a fractal orbit. For most of my life, one of the persons most baffled by my own work was myself. If you have a hammer, use it everywhere you can, but I do not claim that everything is fractal. Engineering is too important to wait for science. 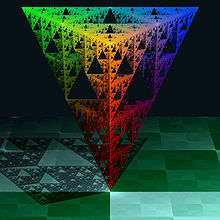 Fractal geometry is not just a chapter of mathematics, but one that helps Everyman to see the same world differently. A fractal is by definition a set for which the Hausdorff-Besicovitch dimension strictly exceeds the topological dimension. The first night I saw the set, it was just wild. The second night, I became used to it. After a few nights, I became familiar with it. I always felt that science as the preserve of people from Oxbridge or Ivy League universities — and not for the common mortal — was a very bad idea. There is no single rule that governs the use of geometry. I don't think that one exists. There is nothing more to this than a simple iterative formula. It is so simple that most children can program their home computers to produce the Mandelbrot set. … Its astounding complication was completely out of proportion with what I was expecting. Here is the curious thing: the first night I saw the set, it was just wild. The second night, I became used to it. After a few nights, I became familiar with it. It was as if somehow I had seen it before. Of course I hadn't. No one had seen it. No one had described it. The fact that a certain aspect of its mathematical nature remains mysterious, despite hundreds of brilliant people working on it, is the icing on the cake to me. The Mandelbrot set is the modern development of a theory developed independently in 1918 by Gaston Julia and Pierre Fatou. Julia wrote an enormous book — several hundred pages long — and was very hostile to his rival Fatou. That killed the subject for 60 years because nobody had a clue how to go beyond them. My uncle didn't know either, but he said it was the most beautiful problem imaginable and that it was a shame to neglect it. He insisted that it was important to learn Julia's work and he pushed me hard to understand how equations behave when you iterate them rather than solve them. At first, I couldn't find anything to say. But later, I decided a computer could take over where Julia had stopped 60 years previously. What motivates me now are ideas I developed 10, 20 or 30 years ago, and the feeling that these ideas may be lost if I don't push them a little bit further. The most important thing I have done is to combine something esoteric with a practical issue that affects many people. In this spirit, the stock market is one of the most attractive things imaginable. Stock-market data is abundant so I can check everything. Financial markets are very influential and I want to be part of this field now that it is maturing. There is a problem that is specific to financial markets. In most fields of research, when someone makes an important finding, they publish it. In the case of prices, they set up a firm and sell advice about their discovery. If they can make money from it, they will. So the research into market dynamics is a closed field. In a different era, I would have called myself a natural philosopher. All my life, I have enjoyed the reputation of being someone who disrupted prevailing ideas. Now that I'm in my 80th year, I can play on my age and provoke people even more. My work is more varied than at any other point in my life. I am still carrying out research in pure mathematics. And I am working on an idea that I had several years ago on negative dimensions. … Negative dimensions are a way of measuring how empty something is. In mathematics, only one set is called empty. It contains nothing whatsoever. But I argued that some sets are emptier than others in a certain useful way. It is an idea that almost everyone greets with great suspicion, thinking I've gone soft in the brain in my old age. Then I explain it and people realise it is obvious. Now I'm developing the idea fully with a colleague. I have high hopes that once we write it down properly and give a few lectures about it at suitable places that negative dimensions will become standard in mathematics. The Mandelbrot set covers a small space yet carries a large number of different implications. Is it a fitting epitaph? Absolutely. The notion that these conjectures might have been reached by pure thought — with no picture — is simply inconceivable. There is a saying that every nice piece of work needs the right person in the right place at the right time. For much of my life, however, there was no place where the things I wanted to investigate were of interest to anyone. So I spent much of my life as an outsider, moving from field to field, and back again, according to circumstances. Now that I near 80, write my memoirs, and look back, I realize with wistful pleasure that on many occasions I was 10, 20, 40, even 50 years "ahead of my time. My ambition was not to create a new field, but I would have welcomed a permanent group of people having interests close to mine and therefore breaking the disastrous tendency towards increasingly well-defined fields. Unfortunately, I failed on this essential point, very badly. Order doesn't come by itself. My efforts over the years had been successful to the extent, to take an example, that fractals made many mathematicians learn a lot about physics, biology, and economics. Unfortunately, most were beginning to feel they had learned enough to last for the rest of their lives. They remained mathematicians, had been changed by considering the new problems I raised, but largely went their own way. For many years I had been hearing the comment that fractals make beautiful pictures, but are pretty useless. I was irritated because important applications always take some time to be revealed. For fractals, it turned out that we didn't have to wait very long. In pure science, fads come and go. To influence basic big-budget industry takes longer, but hopefully also lasts longer. One of my conjectures was solved in six months, a second in five years, a third in ten. But the basic conjecture, despite heroic efforts rewarded by two Fields Medals, remains a conjecture, now called MLC: the Mandelbrot Set is locally connected. The notion that these conjectures might have been reached by pure thought — with no picture — is simply inconceivable. Today, after the fact, the boundary of Brownian motion might be billed as a "natural" concept. But yesterday this concept had not occurred to anyone. And even if it had been reached by pure thought, how could anyone have proceeded to the dimension 4/3? I always saw a close kinship between the needs of "pure" mathematics and a certain hero of Greek mythology, Antaeus. The son of Earth, he had to touch the ground every so often in order to reestablish contact with his Mother; otherwise his strength waned. To strangle him, Hercules simply held him off the ground. Back to mathematics. Separation from any down-to-earth input could safely be complete for long periods — but not forever. In particular, the mathematical study of Brownian motion deserved a fresh contact with reality. When you seek some unspecified and hidden property, you don't want extraneous complexity to interfere. In order to achieve homogeneity, I decided to make the motion end where it had started. The resulting motion biting its own tail created a distinctive new shape I call Brownian cluster. … Today, after the fact, the boundary of Brownian motion might be billed as a "natural" concept. But yesterday this concept had not occurred to anyone. And even if it had been reached by pure thought, how could anyone have proceeded to the dimension 4/3? To bring this topic to life it was necessary for the Antaeus of Mathematics to be compelled to touch his Mother Earth, if only for one fleeting moment. How could it be that the same technique applies to the Internet, the weather and the stock market? Why, without particularly trying, am I touching so many different aspects of many different things? A recent, important turn in my life occurred when I realized that something that I have long been stating in footnotes should be put on the marquee. I have engaged myself, without realizing it, in undertaking a theory of roughness. Think of color, pitch, heaviness, and hotness. Each is the topic of a branch of physics. Chemistry is filled with acids, sugars, and alcohols; all are concepts derived from sensory perceptions. Roughness is just as important as all those other raw sensations, but was not studied for its own sake. … I was not particularly precocious, but I'm particularly long-lived and continue to evolve even today. Above a multitude of specialized considerations, I see the bulk of my work as having been directed towards a single overarching goal: to develop a rigorous analysis for roughness. At long last, this theme has given powerful cohesion to my life … my fate has been that what I undertook was fully understood only after the fact, very late in my life. To appreciate the nature of fractals, recall Galileo's splendid manifesto that "Philosophy is written in the language of mathematics and its characters are triangles, circles and other geometric figures, without which one wanders about in a dark labyrinth." Observe that circles, ellipses, and parabolas are very smooth shapes and that a triangle has a small number of points of irregularity. Galileo was absolutely right to assert that in science those shapes are necessary. But they have turned out not to be sufficient, "merely" because most of the world is of infinitely great roughness and complexity. However, the infinite sea of complexity includes two islands: one of Euclidean simplicity, and also a second of relative simplicity in which roughness is present, but is the same at all scales. A cauliflower shows how an object can be made of many parts, each of which is like a whole, but smaller. Many plants are like that. A cloud is made of billows upon billows upon billows that look like clouds. As you come closer to a cloud you don't get something smooth but irregularities at a smaller scale. An extraordinary amount of arrogance is present in any claim of having been the first in "inventing" something. It's an arrogance that some enjoy, and others do not. Now I reach beyond arrogance when I proclaim that fractals had been pictured forever but their true role remained unrecognized and waited for me to be uncovered. Do I claim that everything that is not smooth is fractal? That fractals suffice to solve every problem of science? Not in the least. What I'm asserting very strongly is that, when some real thing is found to be un-smooth, the next mathematical model to try is fractal or multi-fractal. A complicated phenomenon need not be fractal, but finding that a phenomenon is "not even fractal" is bad news, because so far nobody has invested anywhere near my effort in identifying and creating new techniques valid beyond fractals. Since roughness is everywhere, fractals — although they do not apply to everything — are present everywhere. And very often the same techniques apply in areas that, by every other account except geometric structure, are separate. When the weather changes and hurricanes hit, nobody believes that the laws of physics have changed. Similarly, I don't believe that when the stock market goes into terrible gyrations its rules have changed. It's the same stock market with the same mechanisms and the same people. A branch of physics that I was working in for many years has lately become much less active. Many problems have been solved and others are so difficult that nobody knows what to do about them. This means that I do much less physics today than 15 years ago. 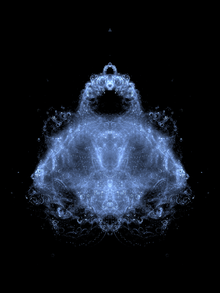 By contrast, fractal tools have plenty to do. There is a joke that your hammer will always find nails to hit. I find that perfectly acceptable. The hammer I crafted is the first effective tool for all kinds of roughness and nobody will deny that there is at last some roughness everywhere. 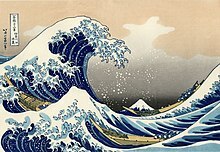 My book, The Fractal Geometry of Nature, reproduced Hokusai's print of the Great Wave, the famous picture with Mt. Fuji in the background, and also mentioned other unrecognized examples of fractality in art and engineering. Initially, I viewed them as amusing but not essential. But I changed my mind as innumerable readers made me aware of something strange. They made me look around and recognize fractals in the works of artists since time immemorial. I now collect such works. An extraordinary amount of arrogance is present in any claim of having been the first in "inventing" something. It's an arrogance that some enjoy, and others do not. Now I reach beyond arrogance when I proclaim that fractals had been pictured forever but their true role remained unrecognized and waited for me to be uncovered. Unfortunately, the world has not been designed for the convenience of mathematicians. People want to see patterns in the world. It is how we evolved … So important is this skill that we apply it everywhere, warranted or not. Contrary to popular opinion, mathematics is about simplifying life, not complicating it. A child learns a bag of candies can be shared fairly by counting them out: That is numeracy. She abstracts that notion to dividing a candy bar into equal pieces: arithmetic. Then, she learns how to calculate how much cocoa and sugar she will need to make enough chocolate for fifteen friends: algebra. People want to see patterns in the world. It is how we evolved. We descended from those primates who were best at spotting the telltale pattern of a predator in the forest, or of food in the savannah. So important is this skill that we apply it everywhere, warranted or not. Georg Cantor claimed the essence of mathematics lies in its freedom. But mathematicians do not pick problems from thin air for the pleasure of solving them. To the contrary, a mark of greatness resides in the ability to identify the most interesting problems in the framework of what is already known. Most of the world is of great roughness and infinite complexity. However, the infinite sea of complexity includes two islands of simplicity: one of Euclidean simplicity and a second of relative simplicity in which roughness is present but is the same at all scales. After having coined this word I sorted my own research over a very long period of time and I realised that I had been doing almost nothing else in my life. The cartoons have the power of representing the essential very often, but have this intrinsic weakness of being in a certain sense predictable. The richest sciences are those in which we start from simple rules and then go on to very, very long trains of consequences and very long trains of consequences, which you are still predicting correctly. The continuity of these thoughts will continue, and if any substitute comes, if any other name comes, which is possible, the ideas will remain. This difficulty — am I a mathematician because my degree says so? Am I an engineer because I'm interested in things? Am I a social scientist because I don't think there's a difference between the turbulence in stock markets in terms of unpredictability? At IBM I wouldn't have to worry about that. The names of departments were totally strange and totally meaningless, so it looked like a promising situation for a short time. As it turned out I was going to spend thirty-five years and twelve days at IBM, almost from the beginning to the day when IBM decided that successful research was no longer going to be carried on in that division. Britain for a long time had a reflection of its class structure which meant that people like, well, J. B. S. Haldane who was the nephew of Lord Haldane, or Bertrand Russell who became Lord Russell, could do what they pleased, and it's interesting to think that Bertrand Russell never had a job, he never had to compete for a job. Haldane had four or five different jobs in his life, totally different. He probably could have — if he had been bothered — have just abandoned his job and went on to live otherwise. … But this no longer exists. IBM no longer exists. I don't see a place now where somebody like myself who combined, let's say, unusual gifts and unusual tastes and, who everybody said has promise, was certainly a misfit of the worst kind could find a position at this point and I think that a tragedy. The word fractal, once introduced, had an extraordinary integrating effect upon myself and upon many people around. Initially again it was simply a word to write a book about, but once a word exists one begins to try to define it, even though initially it was simply something very subjective and indicating my field. Now the main property of all fractals, put in very loose terms, is that each part — they're made of parts — each part is like the whole except it is smaller. After having coined this word I sorted my own research over a very long period of time and I realised that I had been doing almost nothing else in my life. I think it's very important to have both cartoons and more realistic structures. The cartoons have the power of representing the essential very often, but have this intrinsic weakness of being in a certain sense predictable. Once you look at the Sierpinski triangle for a very long time you see more consequences of the construction, but they are rather short consequences, they don't require a very long sequence of thinking. In a certain sense, the most surprising, the richest sciences are those in which we start from simple rules and then go on to very, very long trains of consequences and very long trains of consequences, which you are still predicting correctly. The next thing which surprised us very much, is that both for Julia sets and even more so for the Mandelbrot set, the complication was not, how to say, arbitrary, and almost everybody found the impression that these shapes were hauntingly beautiful. These shapes resulted from the most ridiculous transformation, z2+c, taken seriously, respectfully and visually. And people thought at first that they were totally wild, totally extraterrestrial, but then after a very short time, they came back and said, "You know, I think they remind me of something. I think they're natural. I think they are like perhaps nightmares or dreams, but they're natural." And this combination of being so new, because literally when we saw them nobody had seen them before, and being the next day so familiar, is still to me extraordinarily baffling. The extraordinary surprise that my first pictures provoked is unlikely to be continued. Many people saw them fifteen years ago, ten years ago. Now children see it on their computers when the computers do nothing else. The surprise is not there. The shock of novelty is not there. Therefore the unity that the shock of novelty, surprise, provided to all these activities will not continue. People will know about fractals earlier and earlier, more and more progressively. I think that the best future to expect and perhaps also the best future to hope for, is that fractal ideas will remain either as a peripheral or as a central tool in very many fields. The thought that one unifying idea should continue forever is simply not realistic and therefore not to be hoped for, but I think that for quite a number of years still, perhaps if I am lucky to the end of my life, because I would hate to see that stop in my lifetime, those questions will become very active and still somewhat separate, as different branches of learning become accustomed to them. I cannot imagine that this idea would vanish, not because I am so proud of what I've been doing all my life, but because this is not an artificial thought coming from nowhere in no time and vanishing again rapidly in no time. It has in every one of its manifestations profound roots in the history of the various sciences and the various manners of human enterprise and those roots will not be broken. The continuity of these thoughts will continue, and if any substitute comes, if any other name comes, which is possible, the ideas will remain. This page was last edited on 27 November 2018, at 21:30.